In this day and age where privacy, security and the lack of both (which leads to some very disastrous data breaches) are considered major issues, the question above is getting more and more relevant. We asked more than a thousand consumers from all over the world to put a specific monetary value on each chunk of personal information (passwords, health information, etc) that a trusted third party would have to pay for access. 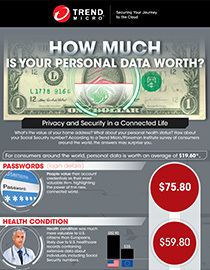 Passwords are the most valued, at US$75.80. Health information and medical records are second, valued at an average of US$59.80. US respondents put the highest value on their health records at US$82.90 while European consumers consider theirs to be worth US$35. Social Security numbers are third, at US$55.70. Payment details rank at fourth at US$36.60. US citizens priced this information at US$45.10 and Japanese valued it at US$42.20. Europeans priced it at US$20.70. Purchase history is the fifth most valued, at US$20.60. US respondents valued it the highest again, while Japan and Europe valued it less. Physical location information is sixth at US$16.10. US citizens priced it at US$38.40 while consumers in Japan and Europe priced it a paltry US$4.80 and US$5.10 respectively. Home address is seventh at US$12.90, with US consumers once more pricing it at US$17.90. Japanese respondents pegged this information at US16.30 while those in Europe priced it at US$5.00. Photos and videos of themselves rank eighth most valued at US$12.20. US respondents wanted US$26.20 for their pictures, while Japan and Europe both asked US$4.70 for theirs. Marital Status is pegged at US$8.30. Japanese consumers asked for US$12.70, while US and European consumers pegged this information at US$6.10 and US$6.00 respectively. Finally, name and gender are the least valued at US$2.90. What do these results show us? One conclusion we can obviously draw from this is that US responders value nearly all their personal information higher than respondents from other countries. Besides cultural differences, this could also be due to how much US consumers value their privacy, and how their day-to-day lives revolve around their own personal information, what with the boom of social media. Take health and medical records, for example—in the US, a person’s medical record may be extensive enough to the point that they can be considered a complete ‘profile’, including not only their name and home address but their social security details and financial information. This could explain why they value it highly. But one thing that stands out: how everyone considers their passwords to be their most valuable information. It’s certainly a testament to how connected people have become in this day and age of the Internet. Unfortunately, we still often hear about consumers and businesses being hacked because their passwords have either been misplaced or easily guessed, despite the high value they placed on it. View the results of the survey in the infographic.